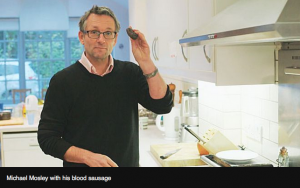 In his latest BBC documentary, Dr Michael Mosley investigates the benefits of consuming your own blood as despite years of research the regenerative properties of blood are only just beginning to be exploited. Whilst eating sausages containing your own blood might not be to everyones taste, the benefits of blood are well know within the aesthetics industry and are utilised in the Platelet Rich Plasma (PRP) or ‘Vampire Facelift’ treatment. Along with Thread Lift treatments, the Vampire Facelift is one of the most talked about treatments currently on the aesthetics market and is an amazing addition to any cosmetic clinic. During the treatment a small volume of the patient’s blood is taken and then separated in a centrifuge. The platelets and plasma can then be injected into scars and wrinkles providing amazing results for patients. Our one-day PRP training course is available to all doctors, dentists, nurses and midwives and costs just £295+VAT. Posted in Botox Training Courses, Cosmetic Training Courses, Cosmetica Training, News | Comments Off on Which course is right for you? In your aesthetic career a time will come when you are limited in what you can treat, indication wise. It is inevitable that you will notice that using a dermal filler to fill out a nasolabial line will not look as good as you once thought and when you treat crow’s feet your client is left with movement that you have not reduced. As we age we lose volume in our face and our malar fat pad descends to a lower position. In this instance rather than treat the nasolabial line you will be best served treating the volume loss that has now been created. Using a volumising product such as Juvederm Voluma, you can give volume to this area which will having a lifting effect on the lower face. It restores a more youthful appearance and lessens the jowls that we see our clients pulling up at the jawline, simulating a facelift. Non surgical treatments are not a replacement for facial surgery, however, they can give dramatic results which may leave our clients resisting a visit to the plastic surgeon. Cheek augmentation and similar advanced non surgical treatments are not just aimed at the more mature clients. We can undertake such treatments on those who are younger and in need of prevention or simply those who long for the structured cheek bones or ogee curve. To be able to offer these treatments a qualified aesthetic practitioner needs to book on an advanced botox and dermal filler training course to obtain a certificate of competence to enable them to utilise their skills in their existing aesthetic clinic. For details of what we cover please contact the office on 0151 722 6070 choosing option 1.
Who Qualifies for Botox & Aesthetic Training Courses with Cosmetica? If you are medical professional who is looking to gain additional skills and expand your practice, then a cosmetic or Botox training course may be the perfect solution. As a result of this, an demand has begun for medical professionals who provide cosmetic services. However with any new business venture, especially when involving a medical practice, there are processes and many questions that need to be answered. Botox is the common brand name used for Botulinum Toxin Type A: a medicine used to reduce the appearance of wrinkles and can also be used to treat certain medical impairments such as excessive sweating and even motor neuron syndrome. Doctors, Dentists and Nurses make for great candidates for Botox training for a number of reasons – primarily because of patient safety. Firstly, Botox is a prescription-only treatment. And secondly, the NHS recommends that the person prescribing the medicine knows your full medical history. For someone already in the medical field, medical professionals will have a better understanding as to who is most compatible for the treatment as well as having the knowledge to deal with unforeseen situations that may arise when an accident or emergency occurs. Botox is generally considered a safe procedure, but this perception could easily be reversed as soon as non-medical professionals become available to administer the treatment. Cosmetica Training specialise in cosmetic training courses for medical professionals only. It is not uncommon for members of the beauty community to offer cosmetic treatments such as Botox. However the real issue here is that Botox is not currently licensed for cosmetic use and any doctor that prescribes it for lifestyle choices are entirely responsible for any adverse effects. The danger with training beauty therapists, hairdressers, and even tattoo artists with Botox is that they are not medically trained. Just because Botox is commonly used for reducing wrinkles, it does not mean that receiving it is as simple or invasive-free as having your eyebrows waxed. As already touched one of a number of medically qualified professionals who are ‘Independent prescribers’ in the eyes of our health system, meaning they don’t need any other authority to sign off their decisions. As Botox is prescription only, it make sense that the prescriber also becomes the distributor, cutting out any middle men in the process and raising the standard of safety in this area. Nurses can also become an ‘Independent prescriber’. As doctors are often swamped in a GP clinic, nurses may have more scope for other non-emergency procedures, such as Botox. Most nurse consultants will hold the status of ‘Independent & Supplementary prescriber’ meaning prescriptions can be made without the pre-approval of a doctor. Access to a doctor for many nurses who are not prescribers, is far easier than someone otherwise not in the medical field. Currently, dentists are considered ‘Independent prescribers’ where the condition affects your teeth. However, due to their experience and background in anaesthesia as well as general medical training, they would make for great candidates for training. If you are a medical professional looking to book a Botox or aesthetic training course, simply call us on 0845 467 7732 or complete our contact us form and a member of the Cosmetica Team will get back to you. Alternatively, if you require further information on cosmetic and botox courses and dates, please visit our Cosmetica Courses page. Posted in Botox, Cosmetic Training Courses, Cosmetica Training | Comments Off on Who Qualifies for Botox & Aesthetic Training Courses with Cosmetica?